The 1891 Club hosted Meredith’s fourth annual Thank a Donor Day on February 28, 2018. 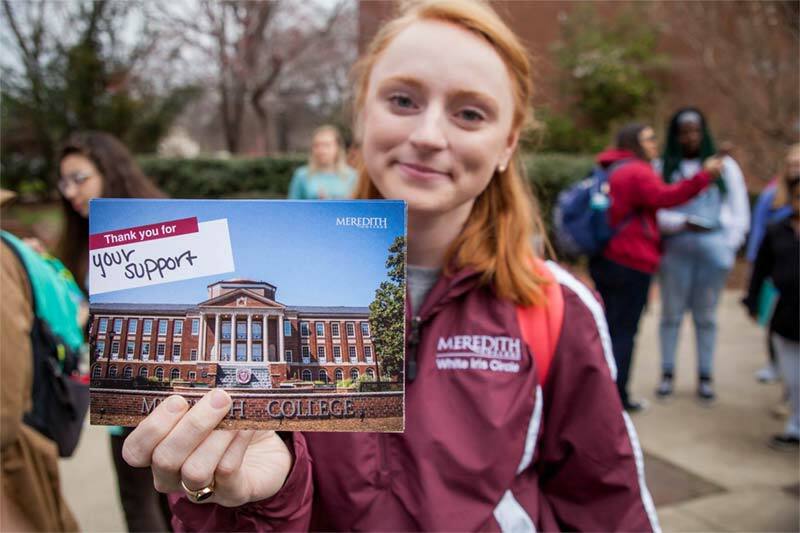 Phonathon students kicked off the festivities on February 27 by calling donors to thank them for their gifts during Make It Count for Meredith Giving Day. The next morning, more than 50 signs were placed around campus to highlight donors and their gifts to the College. During the day, students were encouraged to sign thank you cards for donors at the Cate Center. The students were asked to write what they are most thankful for on the cards. Some responses included: financial aid, scholarships, study abroad, traditions, and professors. Nearly 500 postcards were signed by students. Members of the 1891 Club also delivered treats to faculty and staff whose departments have reached 100% participation in the faculty and staff giving campaign last fall. Several students were highlighted in videos throughout the day on Meredith social media expressing how donors are making a difference in their lives. And a compilation of photos of the day on social media highlighted gifts and showed the gratitude that students have for donors. It was a great day for students to learn about the many ways philanthropy enhances our campus and to celebrate the donors who make it all possible.